Rucking, Donuts, Burpees, Oh My! Risers! We’ve got some great events coming up this week, including (1) a group ruck from Manhattan to Brooklyn (that’s TOMORROW) and (2) a Donut Run from Manhattan to Brooklyn and back (on Friday)! We’ve also got the usual exciting round of fitness on the menu. We tried to contain our enthusiasm for rucking to the month of July. Then it seeped into August with our first RUCKoning workout. “Just once a month is fine!”, we said. But now we’re doing another group walk! At least we’ve been consistent on one end – Tuesday at 7 PM is the definitive rucking day and time! Our group walks are “Simple As Ruck” – so that’s what we’re calling them. We’re meeting TOMORROW (Aug. 28th) on the Manhattan side of the Manhattan Bridge. We’ll head over to Brooklyn, ascend the steps in Fort Greene Park, and make our way to Black Forest Brooklyn for some drinks and good eats. RSVP here to get in on the action! A screenshot of the route is below, and you can view it on MapMyRun here. Back in March we led a run across two bridges, to Brooklyn and back – followed by donuts. This Friday we’re doing the same thing – meeting at the Brooklyn Bridge, crossing it into Brooklyn, and heading back into Manhattan via the Manhattan Bridge! Same two-bridges plan from March, different day! This was back in September of last year – we’ve been to Doughnut Plant quite a few times! RSVP here! Note that there is no bag check available! Whatever you bring, you’ve got to lug with you. But if you’ve been attending all our rucking events, that shouldn’t be a problem! Burpees – what gives? There’s nothing special, though they are the most special exercises. But it’s a reminder that we work out EVERY weekday morning at 6:30 AM, all across the city. You can check out our workout schedule here. And all the photos from last week are here. On Mondays we rock it with HIIT. Last week Hélène brought her niece and nephew to The Rise – and we made sure to throw in some French! After just “une demie-heure”, we covered Washington Square Park in sweat! while in Brooklyn we hit imaginary baseballs out of Grand Army Plaza. Wednesdays bring us to Bryant Park for Boot Camp! And last week we were a little bit crabby – not in our attitude, but in our preferred mode of transportation! Thursdays take us BACK to Queens. If you’ve never made it out to Forest Hills, you’ve got to give it a try! The 4×4, dice roll, and pyramid combo cannot be beat. And lastly – Fridays are for Hills! Normally we meet at the Williamsburg Bridge (BUT REMEMBER – this week we’re starting on the Manhattan side of the Brooklyn bridge). The Brooklyn Bridge will be much less crowded at 6:30 AM! All our workouts are listed here. 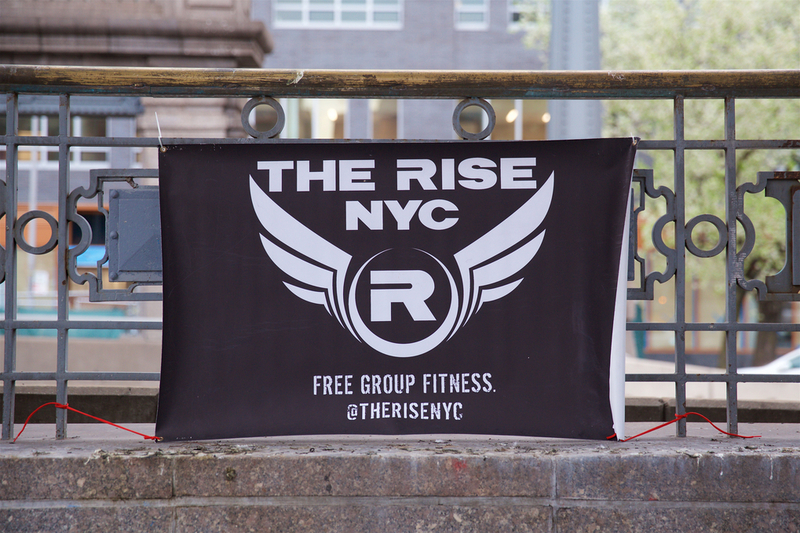 Make sure to like The Rise’s Facebook page, and join the NYC Facebook group where all the social activities happen! Bring a friend. Heck, bring ten friends! We love social media, but nothing gets the job done like classic word of mouth. If you have any questions, feel free to get in touch!